Home > Hallmark Ornaments By Year > 2011 Hallmark Ornaments > View All 2011 Hallmark Ornaments > 2011 Silly Sounds Elf - Magic! 2011 Silly Sounds Elf - Magic! This 2011 Hallmark Keepsake ornament is fabric. 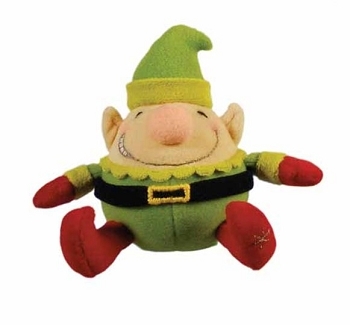 Squeeze the elf's nose, press his tummy or tickle his toes to hear silly sounds. It's a Bargain...ORIGINAL BOX PRICE $17.95 !! Size: 5Ã‚Â¾" x 4Ã‚Â¾" x 3Ã‚Â¼"
Power Source: Battery Operated. Requires 3 LR44 batteries (Included). To purchase replacement batteries, click here. I have one of these and my son in law liked it so much I got him one. I love this little guy..I giggle when I hear him. I gave him to my granddaugher's... they just giggled when they hear him..
Each year since my son left home in 1996, I have bought ornaments for my children and as their family grew, my grandchildren. My youngest grandchild is now 2. I bought this for him. While Hallmark has some really beautiful ornaments, at the ripe age of 2, he is going to want to play with his ornament. This elf is perfect. It beeps, giggles and makes silly sounds and is soft and cute. He won't break it and it's a silly looking memory for him when he gets older. I like this ornament. 2011 Lumpy the Coal - Magic!